On a ride to day with Tren and a friend of his I finished marking the trail. There was a half inch of snow on the ground and it made the trail really easy to follow. Below is the stream crossing section that I think is better to cross just one stream than two. 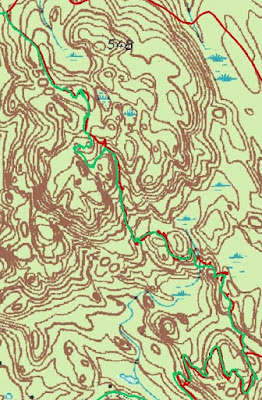 Also I like the idea of coming around the hill top and making sweeping hairpin turn and heading straight down to the stream crossing. There is a mess of fallen trees that will have to be cleaned up but it makes for nice trail. I foresee, however, a shortcut being developed, that I shown below with a purple dashed line. Now that the marking is done, I am waiting to hear back from the DEP on the final approved trail proposal. From what hear, there might be more than one recommendation besides doing something about the connector trail. I hope I get it soon. I think I have to walk the final proposed trail with DEP before any work can be done. I hope to have all this done before March 29th because that is when I am holding Trail Design and Building class for area mountain bikers and Newtown Bridal Lands Association.